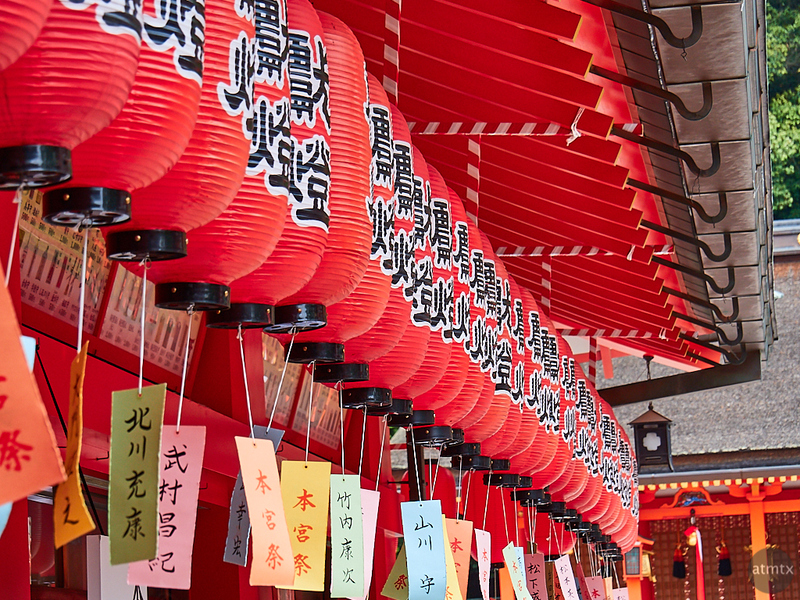 For today’s detail, lanterns or Chochin, in Japanese, at the Fushimi Inari-taisha shrine. These are often used in matsuri, or Japanese festivals. The colored tags underneath the Chochin have people’s names written on them. Donors, most likely. How much does it cost for the honor? I have no idea. Whenever I see nearly identical items in a row like this, I’m tempted to do some compression. Photographic compression that is. All that is required is a telephoto that squishes the distance between the items, which is what telephotos do. The longer the telephoto, the more compressed things get. That’s how you can get a beer can to look as tall as a distant mountain. In this photo, I used a modest 112mm equivalent. Enough to lineup the lanterns next to each other. The relatively compact Olympus 14-150 f4-5.6 is an excellent travel zoom, with enough range to shoot almost every scene. I created all of my Fushimi Inari-taisha detail photos with it. While the lens gets tougher to use in darker conditions, because of the smaller aperture, during the day it’s super handy.